A delightful book with a thinly-veiled message about poaching. 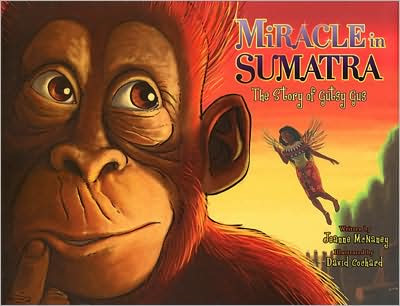 If your going to look at Miracle in Sumatra from the point of view that's it's just a children's book, you'll be very pleased. The colors are bold, the illustrations are beautiful and every two page spread has some kind of color on it. The text itself is large and flowing but very readable, gives a more whimsical feel to the book. I do have to warn the overly sensitive. There is a Guardian Angel in this book. "the beautiful angel Gabriella, the guardian of the jungle...sent from heaven...". She's on the cover so you can't miss her. Now that that's over with. I LOVE this book. There are a lot of words so it is more of a read-to-me kind of picture book. Once again, I wish I had borrowed a little one. The message is a little in your face but the book is basically a good vs evil book. The evil in this case is humans cutting down the jungle and capturing/selling the animals. Teamwork and digging down deep inside yourself save the day. Fun beginning, possibly scary middle, happy-ever-after ending. Deep in the lush, tropical jungles of Sumatra there lives a very special and courageous little orangutan named Gutsy Gus. One day, when Gus is out playing his parents are captured by a group of trappers, and Gus sets out on a daring adventure to rescue them. With the help of a guardian angel named Gabriella and a brave little girl named Maya, Gus fights for his parents' freedom and proves, against all odds, that even one small orangutan can make a very big difference. There is a note on the front cover flap that a percentage of all profits from the sale of this book will go to organizations that support wildlife conservation and endangered species preservation. Disclaimer: I received a complimentary review copy of this book without any obligation to write a positive review. The opinions expressed in this post are mine and may differ from yours. Book information courtesy of Barnes & Noble, description from the front cover flap. This looks cute. Thanks for sharing about it.